Missouri's Lake of the Ozarks, located nearly equidistant from the state's huge metropolises in St. Louis (to the east) and Kansas City (to the west) and 90 miles from the state capital of Springfield, is not the easiest place to get to. But once you're there it's surely worth the trip with vacationers - most specifically golfers, boaters and fishermen - scurrying to the region during all seasons. Lake of the Ozarks vacations are defined by the lake, which is the largest manmade body of water in the Midwestern United States more than 1,100 miles of shoreline in four different Missouri counties. The area has many waterfront accommodations, restaurants and recreational and entertainment venues as well as a wide variety of lodging, restaurants, state parks and other recreational activities to suit any budget and taste. A big part of the allure of the region is that it offers 14 golf courses, each routed through a combination of forests, water and elevations carved and the rolling hills that will challenge any game, from weekend duffer to low-handicapper. During a recent trip to the area, we played four of its golf courses over a three-day period and interspersed a lovely boat trip on the lake, fine dining throughout and relaxing nights under the clear, star-filled skies. One of those days featured a round at the fabulous Osage National Golf Resort, home of Missouri's only Arnold Palmer Signature course and 27 holes of championship golf set in a beautiful valley surrounded by the imposing bluffs of the Osage River. Taking the challenge at Osage National brings three distinct nines - the River, the Mountain and the Links - into play. The River and Mountain nine were Palmer's original layout and opened for play in 1992 and was the site of a course-opening skins game between Palmer, Payne Stewart, Lee Trevino and Tom Watson that seems like the stuff of legend when you are on the course. The Links nine opened in 1998, and combining all three nines gives the course's operators the opportunity to fill the day with different rotations for 18, 27 or 36 holes of golf. The course offers consistently large, well-manicured greens with mild undulation, Zoysia fairways and five sets of tees to provide a true golf test for any skill level. Additional golf amenities at Osage National Golf Resort include a 20,000-square foot clubhouse, an award-winning pro shop and an expansive practice area with driving range and chipping and putting greens. This place offers a little bit of everything and a whole lot of fun. For more of the same challenges as Osage National taken to an even higher level of quality golfers can tee it up at the Club at Old Kinderhook, a flawless Tom Weiskopf design. 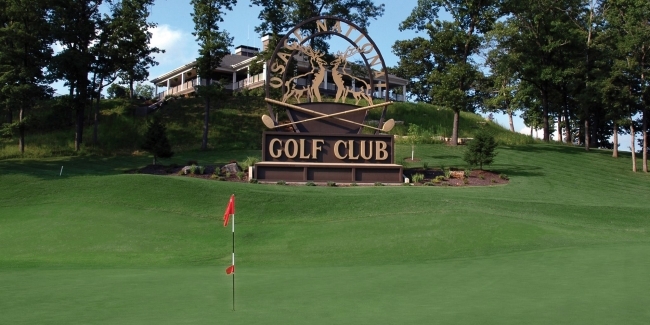 The course meanders through the Ozark Hills, turning rolling topography, rock waterfalls and flowering trees into a challenging and pleasant track from start to finish. Each hole seems to capture a special aspect of the terrain and offers an experience to delight golfers of all skill levels. Opened for play in 1999, Old Kinderhook has no tricked-up design elements and few forced carries, sporting fairways with reasonable width in a fair, but demanding, routing. The course is a 6,855-yard par-71 layout featuring Zoysia tees and fairways and large Bentgrass greens. Beginning with the 430-yard first hole and reaching its crescendo with back-to-back two-shotters at the 432-yard fourth and the 446-yard fifth, Old Kinderhook's front-side is defined by its par-4s. Water is prevalent in on Nos. 4, 5 and 8 (another testing par-4 that asks you to play over a creek and right of the pond that sides the green on the left), but is not a problem for the low-handicap player. The putting surfaces are offset on hole Nos. 4, 6 and 9, the latter of which is the front's lone par-5 and - at 514-yards - can be reached by two long and accurate shots. While the par-4 10th is a force to be dealt with, the back-nine at Old Kinderhook switches tack and relies on its two par-3s and pair of par-5s to add spice and challenge. Carded at 202 yards, the 11th plays to a shallow green flanked both left and right by sand. The back's other one-shotter is the 206-yard 16th, which can be a bear if the hole is placed on the back right of the deep, oval-shaped putting surface and over a bunker. Golf Digest magazine has lauded Old Kinderhook with a 4½-star rating while Golfweek has ranked the course as one of the top semi-private courses in Missouri. Old Kinderhook will challenge the most serious golfer, but plays on the friendly side. Along with the two practice greens, an 11-acre practice facility, short game and bunker practice areas, Old Kinderhook also features a golf shop, a member clubhouse with locker rooms, two restaurants and a banquet center with meeting space. Two other tracks we played on the trip - the Robert Trent Jones-designed Cove course at The Lodge of the Four Seasons, and The Oaks course at Tan-Tar-A, fashioned by the renowned architecture duo of Bruce Devlin and Robert Von Hagge - were both fun and challenging in their own right. Both make great companion courses to the ones listed above. The Cove course, opened in 1973 as the original track of the three courses offered for play at The Lodge of the Four Seasons, is a challenge for golfers of all skill levels. With 72 bunkers, rolling hills, and water coming into play on nine of the holes, it's anything but tame. In typical RTJ fashion, The Cove is a target golf course putting an emphasis on getting the ball in play off of the tee. Every golfer will leave with a memory of The Cove's fourth hole, the resort's signature par-3. Playing at 230 yards from the tips, it's all carry over from The Lake's famed "Witch's Cove". The Oaks places a premium on accurate shots and strategic course management. The Oaks was host to the 1994 PGA Club Pro Championship, the largest professional tournament of its kind and challenged some of the best club professionals in the country.